This state expects to use a subclass of BaseSemantics::MemoryCellList as its memory state, and does not expect that MemoryCellList to be byte-restricted. Definition at line 225 of file PartialSymbolicSemantics2.h. Definition at line 251 of file PartialSymbolicSemantics2.h. Definition at line 257 of file PartialSymbolicSemantics2.h. Definition at line 264 of file PartialSymbolicSemantics2.h. Allocates a new state object which is a deep copy of this state. 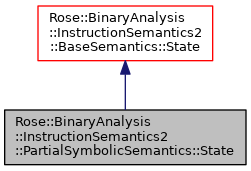 States must be copyable objects because many analyses depend on being able to make a copy of the entire semantic state at each machine instruction, at each CFG vertex, etc. Definition at line 269 of file PartialSymbolicSemantics2.h. If a RenameMap is specified then named values will be renamed to have a shorter name. This is automatically called after each instruction if the policy's p_discard_popped_memory property is set.